I have been pondering since a while if I should post a tutorial about speedy spiral rope since I've used it a couple of times. I came up with the idea when I wanted to make an opera length necklace using some triangle beads. When I began making it I noticed that it would take ages to get the length I wanted if I would make it the simple way; add 3 beads, pick up 2 beads and the triangle bead and then go back through the 3 core beads and pick up another core bead etc. (see diagram below). I'm also working with nymo and it's not as stiff as FireLine or WildFire so I had to pull A LOT on the thread to keep it snug. I thought the thought; what if I would add all the core beads already on a string, and then work my way through them to make the spiral? This is the way I made my opera length necklace, but you can use it to make bangles as well, or whatever else when you want a whole piece without adding a closure. You begin with threading on the amount of beads you want. I recommend a bigger bead like 9/0, 8/0 or even 6/0 depending on how many times you're going through the beads. For this tutorial I chose 8/0's for core beads and 11/0's for the spiral itself. For my Thorn necklace I used 11/0's for the core and then 15/0's together with the triangle beads for the spiral. Depending on what size you pick, I also recommend you to change your needle to a size 12 or even a size 13. When you have the core beads on, you simply join both thread end together by doing some knots - I normally prefer to do a surgeon's knot since it's very secure. After you secured your thread, pass your needle through a couple of the core beads just to secure it a bit more (can never be too careful). Now we come to the spiral itself. Pick up the beads you want for your spiral; in this case I picked up five 11/0 seed beads. Then I pass my needle through the three core beads that came behind from where my thread came out BUT I also pass through the core bead that comes in front of where my thread was coming out. So all in all you pass through four beads. (You can click on the photos to make them larger to get more details). Now that your first part of the spiral is done you simply repeat what you did earlier. 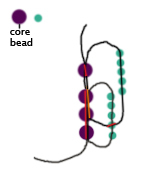 You pass your needle through the three core beads behind from where your thread is coming out, and you also pass through the core bead that is in front if where your thread is coming out - you pass through 4 beads in total. A spiral rope is about moving forward and making a spiral, but do remember to keep the accent beads lined up after each other so you won't end up with a complete mess. For my Mechanical Moon piece I also used the fast spiral rope technique, but I used a nylon coated wire to add my core beads on. The nylon coated wire gives a stiffer feeling and also a stiffer look, and it's secure but you need to crimp it - it's also thick lol. I used a size 12 needle but it would probably work smoother with size 13 or 15 since I sometimes had a problem getting my needle in between the beads, sadly I don't have those needle sizes around heh. The first thing you do with a nylon coated wire is that you measure the length you want since it's not too cheap - you don't want to use more then what is necessary. The you pick up a crimp bead/tube and run the wire through it and then through your closure and back through the crimp bead/tube again and crimp it. (For those that doesn't know how to crimp, I'm sorry, but I'm not gonna explain that in this post). Thread your core beads onto the nylon coated wire until you're happy. Then you just do it as you did earlier but with the opposite part of the closure and then crimp again. Now we get to making the spiral! You tie your thread in between the very first core bead and the crimp bead/tube. Do some square knots and some surgeon's knots to make sure the thread will sit there. If you think it looks ugly with the crimp, just go ahead and use a crimp bead cover. Pass your needle through the three core beads in the beginning. Pick up five 11/0 seed beads. Go back to where you came from; three beads back from where your thread is coming out and pass your needle and thread through them and pass your needle also through the core bead that comes after the core bead from where your thread is coming out. Repeat for the next part: Pick up five 11/0's. Pass your needle through the three beads that comes before where your bead is coming out + the bead that is coming after the bead where your thread is coming out. In total you should pass through four core beads each time. I hope you enjoyed reading this little tutorial on how to make a fast spiral rope. From my own experiences it saves more then half the time of what it would take to make the spiral rope the traditional way. Clever! It's one of those tutorials where I would say, why didn't I think of it first! If you see something you like and are interested in, just e-mail me at "anna.fjellborg@telenet.be" for more information. Any payments will be handled with PayPal. Design by Anna Fjellborg. Powered by Blogger.